The Ultrasonic Diaphragm Plate is the basic building block for the construction of an ultrasonic processing machine. Many transducers are silver-brazed to the Plate to produce intense ultrasonic activity. The plate may be welded directly to your reactor or vessel requiring ultrasonic activation. The transducer cover has been cut away to view the ultrasonic transducers. 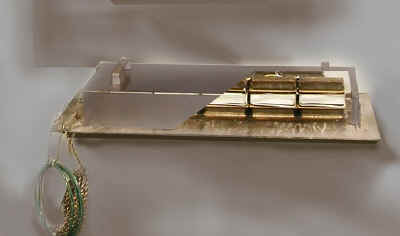 The Ultrasonic Diaphragm Plate is a high-power ultrasonically activated plate built to be welded into an existing reaction vessel or processing tank, (also known as a Weld-In). The Ultrasonic Diaphragm Plate system consists of two major components, the ultrasonic diaphragm plate and the ultrasonic power source, (the generator that converts 50/60 Hz energy to high frequency ultrasonic power). Our Ultrasonic Diaphragm Plates are built to provide maintenance free and continuous operation, (100% duty cycle). These systems will handle large volumes of material for many years without degradation to the ultrasonic processing performance. The UDP design allows the system to be scaled up to meet your processing demands without compromising performance or operational longevity. Several of the variables that influence ultrasonic reaction rates are: particle dwell time within the ultrasonic processing cavity, power input (watt density), spacing between the diaphragm plate and the product requiring acoustic treatment, operating pressure, liquid density, and liquid operating temperature. (Note the 12 inch ruler next to the UDP). We also offer Continuous Transducer Element(s) Ultrasonic Diaphragm Plates. 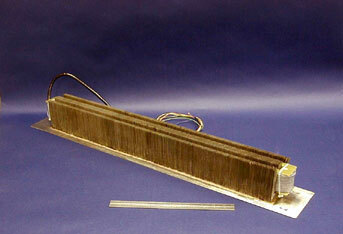 This continuous Transducer is a single transducer element which covers a large area that is 30" long. For large systems, we can combine many Continuous Transducer Elements to construct an Ultrasonic Diaphragm Plate with the dimensions necessary for your installation requirements. This large Ultrasonic Diaphragm Plate has been optimized for side wall mounting. Our manufacturing methodologies allow us to build a UDP with a completely uniform energy profile directly above the transducer mounting area. We can produce a uniform 3-Dimensional energy profile by activating the ultrasonic generator with our Sweep Frequency Operation function mode (SFO). 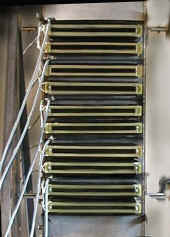 The Sweep Frequency Operation mode produces a dynamic frequency response to the transducer bank. The Sweep Frequency Operation constantly swifts the standing wave pattern by superimposing a variable sweep on the primary resonant frequency.